The original Bob Simmons Slot boards are among the most rare and sought-after collectible surfboards. 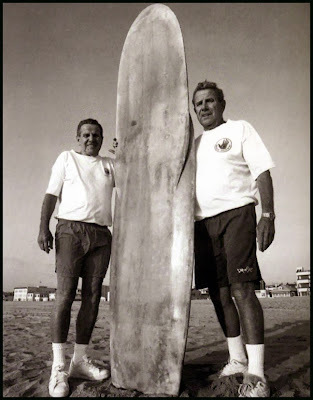 There are only a few in existence, one belonging to the Meistrell family and that is the one this board, made by Greg and Jed Noll was modeled after. Founding Partners and Donor Circle Level Members, Nick and Terri Bacica recently donated this and a beautiful multi-stringered Harbour balsa board. The 3 Amigo collaboration boards (Doc Ball, LeRoy Grannis, and Whitey Harrison) were also made by Greg and Jed and were donated by Nick and Terri.